Bering Sea and Aleutian Islands south to Monterey, California; western Pacific Siberia to northern Japan and northern Korea. Rare strays to Chukchi and Beaufort seas. Habitat: In streams the young use the protective shelter of submerged trees and brush to hide from predators. Adult salmon are pelagic when in the ocean and can be found swimming in open water above great ocean depths. In streams the young use the protective shelter of submerged trees and brush to hide from predators. Adult salmon are pelagic when in the ocean and can be found swimming in open water above great ocean depths. After around 2 years at sea (at an age of around 4 or 5), Coho salmon return to their natal stream in the late summer and fall. Female salmon use their strong tail fin to dig a hole in the gravel called a redd and deposit their eggs. Males compete fiercely to fertilize the eggs, occasionally creating enough of a commotion that a smaller, younger male is able to sneak in and fertilize the newly laid eggs. The female then covers the eggs with small rocks and gravel, protecting them from predators but still allowing the oxygen rich water to reach the developing embryos. Adults die shortly after spawning, their decaying bodies feeding the stream ecosystem for the next generation. The eggs will overwinter in the stream bed and the length of incubation is greatly dependent on temperature. Although the eggs hatch in early spring, the fry do not emerge from the red until May or June. They will stay in calm freshwater pools and lakes for a year or more before moving out to marine waters. Because of their dependence on stream and rivers for spawning habitat, salmon face many threats that do not affect other marine fishes. Populations have decreased dramatically in the southern part of their range and there are several populations that are either listed as threatened or endangered. Even in regions where the overall population is healthy, individual runs are struggling. 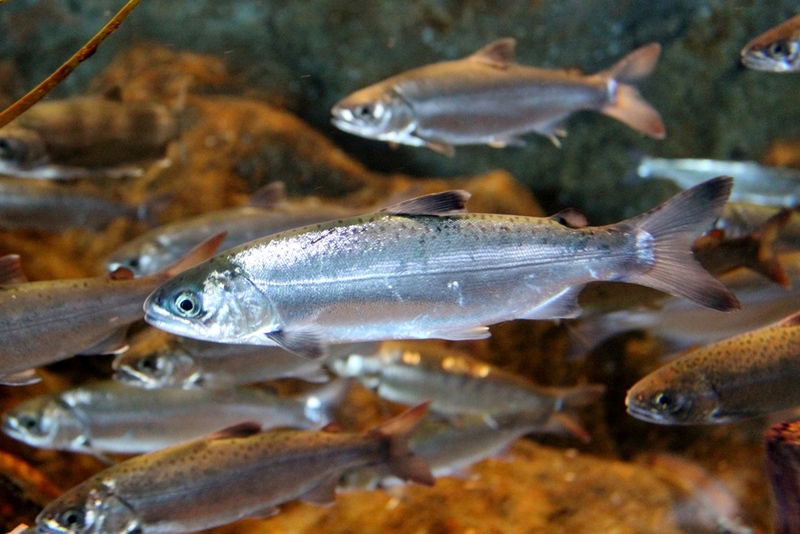 Populations of Coho salmon in Alaska are healthy. There are five species of Pacific salmon: Coho (Silver), Chinook (King), Sockeye (Red), Pink (Humpy), Chum (Dog). The longest Coho salmon run known is 1,320 miles up the Yukon River although these fish usually migrate less than 140 miles. Salmon are a keystone species meaning the effect they have on the ecosystem is disproportionate to their size and numbers. They nourish countless species of marine, freshwater and terrestrial animals as well as forest ecosystems as bears, eagles and other land based predators move their nutrient rich bodies inland.